We are in the middle of a stormy couple of days in Wisconsin. Last night the lighting was giving us quite a show while we were watching Intervention (tear) and the thunder would sometimes shake the windows. I woke up this morning to the rain coming down in sheets and had to DRAG myself out of bed because it was so nice to lay there listening to the storm. Ok, I was listening and Shaun was doing some heavy mouth breathing in dreamland. Rain is to be expected in April, but I do have mixed feelings about the extreme amount we're getting. 93% humidity does not bode well for my floor poly curing, or for our basement, or for my hair. Seriously, 93% humidity shouldn't be legal. Along with 93% of reality TV. I still haven't gotten our rain barrel hooked up. FAIL. So, the bad totally outweighs the good. Do you like how I do a 'pro and con' list, like I can actually do anything about it? I guess I can think "STOP RAINING PLEASE!" and hope mother nature listens. Are you getting lots of April showers? It was POURING when I woke up this morning... drizzling once I trudged out of the house... and the sky was getting sunny when I got out of the subway station... in my wellie boots. We're supposed to get more this afternoon and throughout the week though. Guess it comes with spring time, huh? Right after we put in our Brazillian Cherry Hardwood, we got a bout of 90%+ Humidity. To help things stay dry, we went to Lowes and picked up a de-humidifier. for about $150. It was worth it to save our floors, and now when it gets sticky, we just turn that baby on for 20 minutes, and dry the place out. Saves on Air conditioning bills, too! I am soooo with you on the hair & wet glasses! Did you ever see that Friends episode where they go to Barbados during hurricane season & Monica's hair just keeps getting bigger & bigger? Yeah, that would be me. Rain on my glasses, I also hate, hate, HATE! My neighbor goes swimming with hers on? WTH? How does she not go bonkers? Funny, I think the last time I posted on your blog (I blurk alot) was when you were having sinus issues from not enough humidity. We chronic sinus sufferers have it rough! 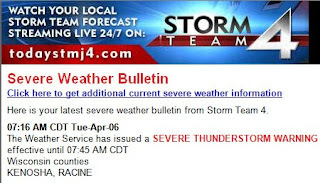 Freakin storms woke me up at 1am last night! Eric, we have a dehumidifier in the basement, but we will probably have to get one for upstairs, too. They do work wonders! We are getting a TON of rain here in the PNW. It's kind of crazy. Our house is next to this green space, and our yard and cars are getting pelted with broken off branches (small ones, luckily!) from the rain and wind. Hopefully it won't be a long spring! I hate hate hate getting rain on my glasses also. so annoying. This is probably why I refuse to wear them out in the rain and will suffer through the contacts every day. We've got nothing in Virginia. My friends and family up north are dealing with the aftermath of too much rain, though. Ughh, I like thunder storms on occasion but I HATE when it rains on end! I hope it clears up for you soon! I'm almost afraid I'm going to jinx myself but we've had beautiful days here. It's feeling more like summer with highs in the 80s and sunny skies. Seeing as we are in the same state, we are in the same boat. Not a pun; I promise. I am just happy that the grass is getting rain and I don't have to spend any extra on the water bill. We are supposed to get storms here tonight... hope you were able to use that coupon!! Yeah it is pouring now....and with a thunder phobic dog it is making for an interesting evening. And I feel your pain with the rain barrel still sitting in the winter location. AND I also am with you on the gutters. After seeing the rain pour over the sides of them and into the yard it looks like they are due for a serious cleaning out. Yuck...rain. Hope yours clears out soon! Oh, I hope you got to get to Pier One and use that coupon. It's worth braving the rain for the important thing. Too many rainy days in a row make me kinda sad and my hair kinda crazy. We're experiencing a heatwave in the Mid-Atlantic. It's nearly 90 degrees in April, which is insane, especially considering the crazy winter we had. I'm not complaining. I love warm weather and long days. At least April showers bring May flowers.